Pizza pizza pizza! I couldn’t go to Rome and not eat proper Roman style pizza! A huge thank you to Shayma at The Spice Spoon for recommending La Montecarlo to me – there are so many pizzerias to choose from in Rome that my mind was boggling. This would be our first time having a proper Roman style pizza – they’re thin and crisp in comparison to the puffier, chewier Neapolitan style. You’ll definitely want to get there early as it gets packed very quickly. As is usual with most Roman restaurants, you’ll be sitting elbow to elbow with your neighbours, the place is loud and jolly, and the waiters fast and efficient. Something I noticed in pizzerias is that on the fried section of the menu, items cooked from frozen are usually clearly marked. 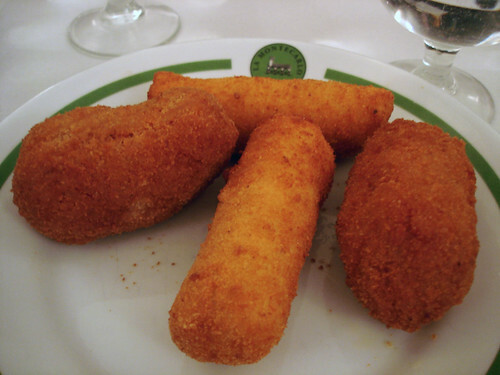 We avoided those and went for a couple of crocchette (potato) and suppli (like arancine, those fried balls of risotto). The crocchette were fine – tasty, crunchy, potato mash – but I prefered the suppli with their centres of tomato sauce and melting mozzarella. I wanted the most classic of pizze, the Margherita. Oh boy, this was magnificent. The crust is indeed extremely thin and very crisp towards the edges, and I loved it. Though thin, it was still sturdy enough to hold its cargo of cheese and tomato sauce. The mozzarella does look different to the fresh kind used on Neapolitan pizzas but it was no less delicious for it. I hoovered this up, yum yum yum. 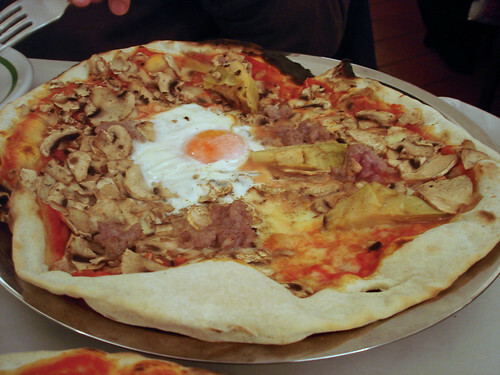 Blai went deluxe and ordered a capricciosa, topped with ham, mushrooms, artichokes and an egg. Though it was tasty, it was less successful than my margherita due to the number of toppings. This made the pizza heavier and more watery and led to a less crispy crust. Blai was also a bit disappointed that the artichokes on top were preserved (canned, we think). Do any places in Italy use fresh artichokes on top of pizzas? Still, the flavour was still good – I quite liked it despite its sogginess. There was just enough space in our tummies for a spot of dessert. We ordered a torta di ricotta to split and it came looking comically like a helicopter. 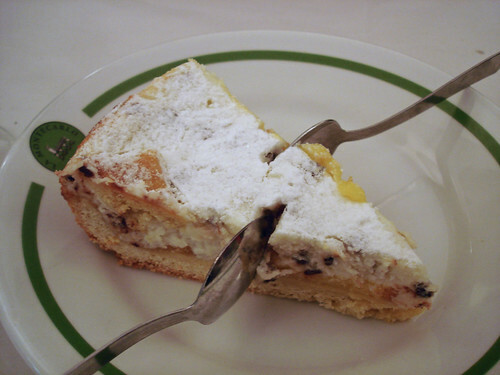 It was gorgeous – the filling was of creamy, fresh cheese studded through with chocolate bits. We loved it here so much that we came back for a last lunch on the day we flew back to London. Looking for a relatively early meal, we were the first in the restaurant at noon. We needed another taste of proper Roman pizza! 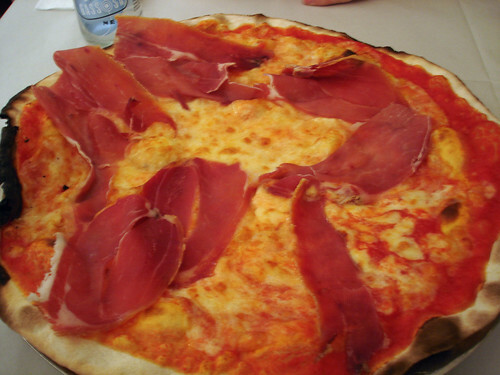 We opted for the pizza al prosciutto, again aiming for one of the simpler pizzas on the menu. This was simply a margherita topped with slices of prosciutto. It was excellent – I was happy to see that there was no reduction in quality even if this was the first pizza out of the oven that day. We’d wanted to try one of their pasta dishes too as we’d seen others enjoying huge platefuls of the stuff on our last visit. 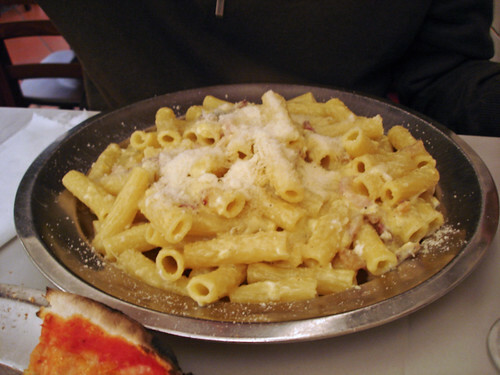 This carbonara (we had to order a Roman pasta for our last meal!) wasn’t as transcendental as the one we ate at La Matriciana and tasted more like our attempts to make carbonara at home (with the whole egg), except for that wonderful guanciale they use everywhere. Still, if it’s pasta you desire, you can’t go wrong with one off their menu and you certainly won’t leave hungry! Look at the size of that pile! But you really should try their pizza at least once! We paid about €20-25 total on each of our visits, making this an excellent budget spot. Oh, I miss La Montecarlo. London, you need a Roman style pizzeria! While this meal was good, I want to make note of the ugly as well. We had dinner one night at Da Ricci (Via Genova, 32) and while the fried bits and pieces were excellent, the pizzas were truly awful. They were thick and crunchy and reminiscent of many frozen pizzas available here. And Blai’s was very very charred on the bottom. I don’t think we were served “special” pizzas on account of being tourists as the Italian woman sitting next to me also received a pizza that was overbaked. Avoid. Every time I stop by here, I see the most delicious-looking pizza, which makes me want to have some myself! Ahh! You definitely want to go on a cruise with Costa Lines; on the Costa Atlantica, we could get pizza almost any time … because you missed a meal, for lunch or to put you on till dinner time. Re the artichokes: could it be that they didn’t have any fresh ones because they’re out of season, or something? Have loved reading your Rome posts – sounds (& looks!) like a delicious trip! These pizzas look so good! It’s funny how I grew up on pizzas with lots of ingredients, but how I now prefer the simple fire oven cooked pizzas. 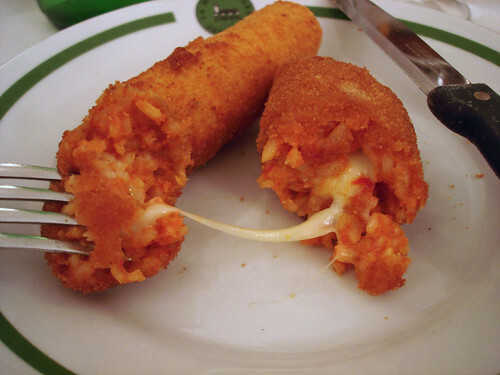 The photo of the suppli with the melting mozzarella is making me long for it! it was a pleasure, Su-Lin, no thanks required. i always order the margherita, it is my fave. and they serve Calabrian chili powder in a small jar with holes punctured in the lid for a sprinkle on your pizza. my friends who were visiting, called it ‘baarood’ which means gun powder in Urdu- spicy but lovely! aixxx: You’re too kind! Well, the blog is going to be pizza light for the next month, I reckon. LexEat: It was – thank you! breadetbutter: I know! I was the same. But really, I won’t turn down any pizza given to me. shayma: Ah, I had no idea about the chili powder – I must ask for that next time! We totally adored their pizzas and would have made it three visits if we had more time! Hi! I just stumbled pon your blog and saw that you were in Rome…. I’m going in two weeks! I can’t wait, as I’ve never been.. Do you have any other suggestions, tips? I’m just jotting a note before I forget, and I’m going to continue on and read your blog entries! Thanks for sharing your experiences! Where did you stay when you were there? Hmmmm… the dishes look wonderful and the pictures amazing. I love French and Japanese cuisines(favourites) but sometimes, only pizza will do! writtenwell: I’ve sent you an email. Oooh, just noticed that I didn’t answer your question about the hotel – will send you another email. Luiz: Oh yes, there’s something wonderfully comforting about pizza, isn’t there? 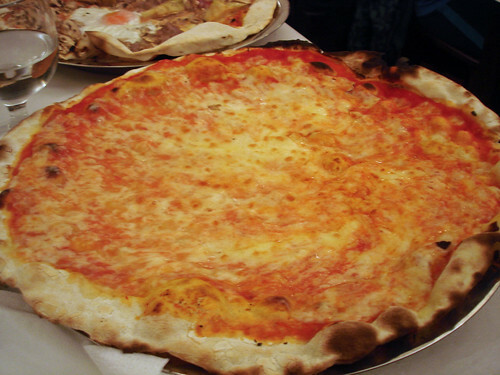 I LOVE looking at pizza photos from Italy. Thanks for sharing! I had arancine for the first time a few months ago, and loved it. Great blog! Too many toppings spoil the pie. Yolanda: Thanks! And thanks for dropping by! Ed Schenk: Indeed and to be fair to them, the crust is very thin and less able to support a multitude of toppings.